Drink carts and canapes are classics and timeless trends at weddings, but they can sometimes get a little bit samey. One idea to keep yours interesting and fitting with the winter vibe by having a festive drink theme. Mulled wine is obviously a favourite, and hot chocolate (which can be bumped up a notch by adding Baileys!) is also a classic choice, or you could even design your own personalised cocktail using seasonal flavours! 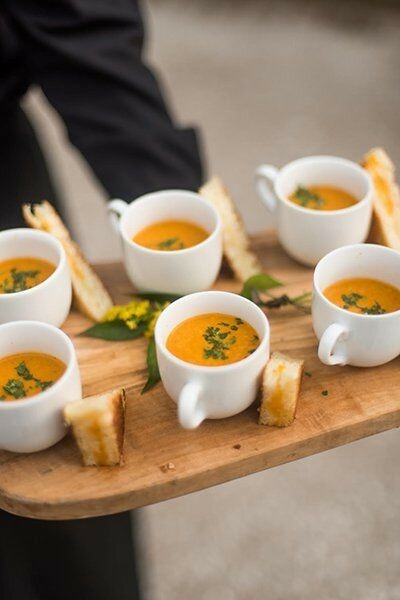 Canapes can also be kept modern and new by utilising the seasonal foods, or even try using local produce! Try thinking figs, warming soup, even little pigs in blankets! Greens such as pine, redwood, cedar and magnolia are all perfectly in season November to January, so act as wonderful additions to bouquets and table decorations. Pine cones are also cheap (you can literally find them out and about) and add a wintery woodland vibe to your décor. When combining this foliage with golden candles or fairy lights it creates a beautiful combination we’re sure will be taking winter weddings by storm this year. One of the biggest Summer trends of 2018 was the ‘Naked Cake’ – a wedding cake that wasn’t iced, topped instead generally with berries. For a Christmassy twist on this trend, we’re loving the semi-naked cake – a wedding cake that is iced with the initial layer of buttercream that normally comes before the royal/rolled icing and then left at that stage! Topped with seasonal fruits and flowers (cranberries, figs, holly) it is a beautiful option for a wintery wedding cake! Trees, Trees and more trees! As seen in the cake picture above, slices of trees/logs are a very popular décor option for festive weddings; they are practical too! They can be used as cake stands, name places, and signs! Actual trees are also an idea for the seasonal wedding – it’s Christmas time so let’s have some Christmas trees! Whilst in the home people generally only have one tree, the latest trend for 2018/19 is to have multiple trees! The latest on colours for winter 2018/19 is to pick two signature/feature colours for the day and stick to those. Of course, the classics of white and green or red and gold are always good, but the newest addition is the combination of navy and gold. Navy is a well-suited choice for winter, as it is classy and sophisticated yet a gorgeous, sharp contrast to the white of the bride. Gold works well as a subtle accent to the white whilst bringing in a Christmas sparkle. Whether it be a hand written “Tis the season to be married!” on a chalk board, or a box of blankets with the accompanying sign reading “to have and to hold, in case you get cold!”, re-writing Christmas phrases can be cheesy and tacky unless done right, but when done tastefully, they can add a romantic, festive and personal touch to the décor. If your venue has the option, open fires or log burners are a fantastic addition to a winter wedding, as not only do they keep the venue cosy and warm, they give off that delicious smoky smell! If your venue doesn’t allow open fires but does have feature fireplaces, one way to mimic the effect is to fill the fireplace with candles or fairy lights! Brand New and Opening Soon... Fynn Valley Cafe Terrace!